The apostle Paul gave important advice to Christians living in Thessalonica and also to each one of us today: “Examine everything carefully; hold fast to that which is good” (1 Thess. 5:21, NASB). This composes particularly timely counsel when considering the topic of spirituality. I learned that lesson the hard way. More than 25 years ago, I embraced the “spiritual formation” movement. In retrospect, I must confess that I was somewhat careless and naïve. I had good intentions but lacked wisdom. In recent years, I have become more and more convicted that we need a firm biblical foundation as we seek a more intimate relation­ship with God. 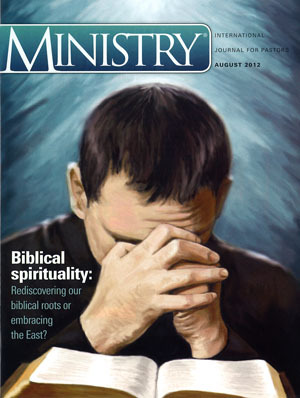 This special issue of Ministry is devoted to that same objective. We must examine every­thing carefully and hold fast to that which is good. For example, prayer is vitally important. But not all prayer promoted today is in harmony with the teachings of Scripture. Some suggest the use of Christian mantras or breath prayers, like the continued repetition of the name “Jesus” or short phrases like “Peace be still.”2 However, Jesus taught that prayer should not be a vain repetition (Matt. 6:7). Prayer should have intelligible content and progression of thought (see vv. 6:9–13) rather than an emp­tying of the mind to encounter the God who lives within. The Scriptures encourage meditation. But not all meditation promoted today is in harmony with the Word of God. One author makes this suggestion: “You may want to picture in your mind’s eye the coming of Jesus across the field or over the lake’s waves or entering the place you picture yourself in. As Jesus comes to you, hear Him speak words of welcome and love for you.”3 I heard similar words when I first began to explore spiritual forma­tion many years ago. But soon I was impressed to ask a vitally important question: How do you know that Jesus is speaking? In these experi­ences with visual imagery, there is no mention of parameters set by the inspired testimony of Scripture. New Age mystics engage in visual imagery but they receive instruc­tion from spirit guides. We must not fall into the same delusion; our meditation must always be based on Scripture. The biblical teaching concerning meditation involves a focusing of the mind on the Word of God (Ps. 119:15, 48, 99, 148; Phil. 4:8), and all lessons learned must be tested by the Scriptures. While false teachings regarding spirituality are prevalent, we must be careful not to reject or criticize genuine expressions of biblical spiri­tuality. For example, in some cultures everyone stands when someone offers public prayer. In other cultural settings, people bow down or kneel to pray. One approach may not be necessarily right and the other wrong. Where the Bible does not offer definite instruction, we need to allow room for individual expression. But where the inspired teaching of Scripture is clear, we must hold fast to that which is good and turn away from that which is not in harmony with the Word of God. 1 You can request a copy of the Christian Spirituality syllabus at feedback@ministrymagazine.org. 2 www.thechristianmeditator.com/mantra_meditation.html; Thomas Keating, Open Mind, Open Heart (New York: Continuum, 1992), 134, 135. 3 Michael W. Foss, Real Faith for Real Life: Living the Six Marks of Discipleship (Minneapolis, MN: Augsburg Press, 2007), 31. 4 For a video presentation that further develops the concepts presented in this editorial, go tohttp://www.afcoe.org/resource-center/video-library/id/372/derek-morris-afcoe-to-go-session.aspx.